inspire students to attain their high school and college diplomas, and career certifications. 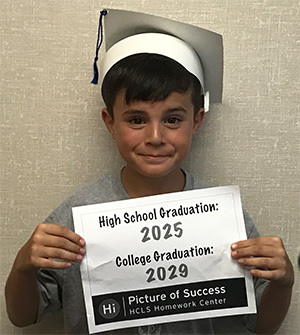 At the end of each school year, HCLS Homework Center students will have the opportunity to get their pictures taken. This photo will feature students in graduation caps, noting the years they will graduate from high school and college. This A+ Partners in Education initiative is made possible by Keith and Amy Gonce, and Friends of Howard County Library System.